A new trailer for the Pirates of the Caribbean: Dead Men Tell No Tales came ashore at this year's Super Bowl, set to the soundtrack of Johnny Cash’s Ain’t No Grave. The film will see the return of Depp as Captain Jack Sparrow, Geoffrey Rush as Captain Barbosa; Orlando Bloom as Will Turner; and Kevin McNally as Joshamee Gibbs. 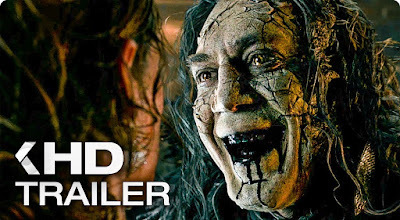 This time, Captain Sparrow will come up against a new foe in the form of Captain Salazar, played by Javier Bardem, a ghost pirate who could do with some moisturizer on his face by the looks of it. Pirates of the Caribbean: Dead Men Tell No Tales hits theaters on May 29, 2017.